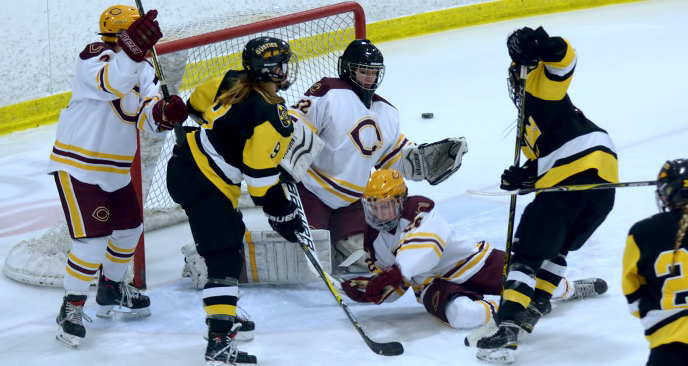 MOORHEAD, Minn. – For the fourth consecutive game, the Gustavus women’s hockey team shut out its opponent, blanking Concordia 3-0 on Friday night. The No. 6-ranked Gusties recorded their eighth shutout of the season, improving to 16-2-4 overall and 10-2-3 in the MIAC, while the Cobbers fall to 9-10-3 overall and 6-6-3 in the league. The four consecutive shutouts mark the longest streak by the Gusties since the 2009-10 season. After a scoreless first period that saw a total of eight shots, Allie Stanger (Jr., Paynesville, Minn.) scored at the 14:06 mark of the second period with the help of Elly Strunk (Fy., Blooming Prairie, Minn.). And with 29 seconds remaining in the middle frame, Strunk tallied her first career goal on an assist from Madison Bergren (Jr., Mahtomedi, Minn.), her first of the season. Concordia pulled its goalie with 2:18 remaining in regulation and Diana Draayer (Sr., Deephaven, Minn.) took advantage with her 15th goal of the season at the 18:25 mark. The Gusties outshot the Cobbers 28-15 as Amanda DiNella (Jr., Oakbrook Terrace, Ill.) made all 15 saves for her 14th career shutout. DiNella has gone the last 281:32 without allowing a goal. Both teams went 0-for-2 on the power play. Faceoffs were heavily in favor of the visitors, 44-15, led by Erica Power (Sr., Lakeville, Minn.) going 22-8 on the dots. The series concludes at 2 p.m. tomorrow at the Moorhead Youth Hockey Arena.